Home › Great Menus › Perfect Steak–My Way! Not long ago, I learned a valuable lesson in my relationship with Kathy. Turns out, I can dazzle her when I prepare and cook her favorite food items. You ask: How did you not know that sooner than recently? Well, it’s because SHE always prepared and cooked her favorite food items because she liked them HER Way. I sort of thought that since they were her favorites, and because she knew how she liked them prepared, it was better to leave those items to her skills. Seemed rational to me. Until recently. She has been busy of late, and hasn’t had much chance to cook. But one day recently, she had selected a nice, thick steak (her #1 favorite dinner) while she was at the store, and intended to grill it for dinner that night. Some days don’t go as planned, and on that particular day she called home to let me know she was running very late. So I volunteered to take on the task of preparing the steak, with the proviso that I could prepare it ‘my way’. Keep in mind Kathy thinks steak is at its best when grilled to a black char on the outside, and to a perfect rare to medium-rare on the inside. She calls it ‘black and blue’. I have no idea what that description means other than it’s a Pittsburgh thing, and her father called steak prepared this way ‘black and blue’. She also knows I don’t like to grill, and ‘my way’ would not be ‘her way’. But at that point, it was me or her preparing dinner at 10 pm—she chose me. Wise choice. There was a lot at stake–pun intended! I knew I was setting myself up for Kathy’s “it’s good, but not as good as mine” evaluation by doing the steak My Way, but I had not done it for her in quite some time and I had secretly honed my skills and know-how over the past several months. I was ready and up to the challenge of demonstrating my prowess at the altar of the Best Steak Competition with Kathy. So I went to work. She loves a Simple Salad with my Balsamic Vinaigrette [see June 8, 2012 Post] to go with her steaks. So I got the salad prepped and got the steak ready for cooking. When she walked in the door, there was a glass of Bordeaux to go with her while she changed. And then I got the steak cooking. In the time it took us to catch up on our day, about twenty-five minutes later, we were at the table ready to eat. The outcome? She enthusiastically declared that Perfect Steak—My Way was at least as good as Her Way. YES!! And better yet, even though she will still do steak her way when she cooks it, she stated she would let me do Perfect Steak—My Way more often. Seriously, this is nearly a fool-proof approach to a perfectly cooked steak and I learned the technique from a close friend of mine who also loves Steak–His Way! I know this recipe has a long list of directions, but don’t panic. Most of it is really good advice on how to choose the right cut of meat. Then I guide you on how to take 4 other ingredients and turn them into a steak masterpiece of artful taste, texture and tenderness. Read through the directions and go to work. 1. BUYING: First off, we already know the best ingredients yield superb results. Therefore, you need to buy a great steak. And here’s my thinking on the subject. I don’t eat red meat very often, but when I do, I want to indulge myself with the very best. Therefore, I buy a nice 1-1/2 to 2 inch thick New York Strip, one of the best sirloin cuts, and by far my favorite. 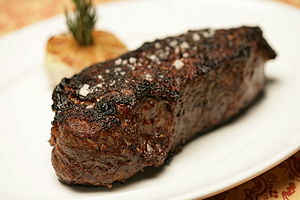 Many people love Filet Mignon because it is the most tender part of the tenderloin and the taste is milder. I also like a T-Bone Steak because it has two cuts of meat on-the-bone: one side of the bone is from the top loin, and the other is a strip of tenderloin. Keep in mind that cuts of meat are called different names in different parts of the country, so do your homework. The key is to look for cuts of steak that are well-marbled with medium to large size pockets or long narrow strips of fat, evenly distributed throughout the meat. This fat is the key to the caramelizing I want to achieve and to the superior taste of these cuts of meat. Prime grade beef makes up only 2% of all the beef produced in the United States and is usually sold only to the very best restaurants. (That’s why high-end restaurants have the best tasting, most tender and most expensive steaks.) 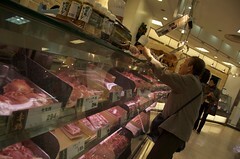 What you will normally find on the shelves at the store or in butcher shops is Choice and Select cuts of meat. Since I’m indulging, I always buy Choice cuts, and so should you. You will notice a difference. The price is higher, but the tenderness and marbling of the meat will be far superior to Select cuts of meat. Here’s the best advice I can offer in the buying department. Find a good butcher and take his or her advice on both the quality and cut of the meat and the portion sizes for your steak purchases. My butcher is at the Whole Foods Store down the street from me, so don’t think you need to go far to find one. 2. SEASONING: If a high-quality cut of meat is cooked correctly, you really don’t need much more than salt and pepper. Which makes you think that seasoning a steak should be easy. Well my Kathy and I have hot debates on this topic all the time, and we don’t usually agree on the “salt early” or “salt late” philosophy. Advocates of the Salt Early Approach argue that salting meat many hours or even days before cooking breaks down the protein in meat and makes it more tender. Initially, the salt draws out moisture, but over time the meat re-absorbs the juices, which is now flavored with salt and thus adds more succulent flavor to the meat. The Salt Late Advocates admonish that salt dries meat out. No more argument needed. Don’t add it until immediately before cooking. Since this is Steak My Way, and since I spent a fair amount of money for a Choice Cut of meat that is already tender, I find salting the meat about a half-hour before cooking is ideal, but doing it right before cooking works just fine, too. I will admit that if you choose to buy the less expensive Select Cuts of meat, salting early is a good way to go, but you need to do it at least 3 to 4 hours before cooking to get the benefits of this approach. 3. PREPPING: Before seasoning, always make sure to pat the steak dry with paper towels. This simple step is critical. I also brush the steak with vegetable oil (avoid olive oil, which can become bitter at high heats) or a combination of melted butter and oil before seasoning to help the outside of the steak brown. Season both sides of the steak, using a teaspoon or less of either kosher or sea salt and freshly ground pepper. Remember, you can always add more seasoning after the steak cooks, but you can’t unseason the meat. 4. After seasoning, let the meat sit quietly so it comes up to room temperature, about 20 minutes for a 2 inch steak. 5. COOKING: You already know I’m not much of a griller. And I actually love browning my steak on the stove top and then finishing it in the oven. When I do it this way, I get a crisp, caramelized coating on the outside of the steak without over-cooking the inside. In my view, this is harder to achieve on a grill. Using a combination of the stove top and the oven is a tried and true method for perfect steak, and often used by high-end restaurants to prepare their most flavorful steaks. But of course, Kathy and I debate this issue too. Kathy thinks the ONLY way to cook a steak is on a hot, uncontrollable grill, over flames jumping up trying to set fire to my precious meat after sucking all the life-giving fat out of my carefully selected, beautifully marbled steak. Kathy claims cooking steak on a grill is an Art-form that takes years of practice and experience before perfecting. My view is this is how our ancestors living in caves cooked their meat. Some of us have now evolved beyond caveman cooking techniques, and should use them to our advantage. Here’s the thing about grilling. Before gas grills, I think the slight taste of charcoal or wood-fired cooking gave to the meat was a nice layer of flavor, worth the extra effort and investing in the know-how. But now that more than 90% of us use gas grills that impart virtually none of this wood-based taste, it’s not worth the effort. A. Pre-heating the oven to 450° to 500° Fahrenheit. B. When the oven is ready, drizzle a little oil in an oven-proof pan (cast iron works great) and then heat the pan on the stove over high heat for several minutes until it just barely starts to smoke. C. Put the steak in the pan and let it sit without touching it for 3 minutes. D. Turn on the exhaust fan or open some windows–there’s going to be smoke. E. If the steak is stuck to the pan, it’s not done browning yet and needs a little more time. When it comes up relatively easily, usually after 3 minutes, flip the steak. F. Put the pan, with the steak in it, in the oven. G. Let it bake for several minutes, then check it with a thermometer or ‘feel’ the texture for doneness. (see discussion below). 6. TESTING FOR DONENESS: A thermometer is the most accurate way to gauge if steak is done to your liking. If using an instant read thermometer, slide it about an inch or so into the side of the steak for,the best reading. Although your thermometer will probably tell you that 145 degrees is rare for beef, most chefs will tell you differently. Rare in a chef’s mind, meaning very pink, is closer to 125° ; medium-rare is 125-130°; medium, 130-135°; medium-well, 135 to 140°; and well, 140° and above. You can also give the steak a poke with your finger. Rare is squishy, medium-rare is spongy, and medium-well is taut. The steak will continue to cook at least five degrees when it’s out of the pan, so err on the side of taking it away from heat earlier rather than later. 7. SERVING: The last steps are critical and include cutting a small pat of butter and placing it atop the steak. Then, before cutting it, I let the meat rest under a loose cover of aluminum foil. As the meat cools down the proteins begin to firm up and hold moisture, so when you cut into the steak all the juicy goodness won’t run out. Furthermore, while the proteins are firming, they will also absorb the butter to add some flavor and richness to the meat. About 8-10 minutes should do it. Coincidentally, that’s about the time it takes for me to break open a French Bordeaux or rich California Cabernet Sauvignon and grab a couple of wine glasses for the table! Your cooking process was very good. However, I do think there is nothing better than a grilled steak!! UMM. Your loving wife. This is my Kathy, using my IPAD to respond to my Post! Ugh! As you can see, she is hard to convince that My Way is better than Her Way. Lou: You make some good points on the purchase of meat and the temp when done. Your POW math is understated. Any POW causes all WOW points to be immediately canceled… Sorry bro, this is especially true with my sister. I go with her on the grilling, now with most grills using gas you can sear much of the juices in using the high setting for 3 minutes on each side and then turn the heat down for cooking the inside. Salting using your first method is great but using salt right before cooking the steak will draw the juices out. I recommend using salt after cooking in that 8 to 10 min. cooling period or after you cut. You might want to mix the salt with the butter. I also like to marinate before with “What is this here sauce”, lemon, butter and pressed garlic juice along with fresh ground pepper. I also use this to baste while cooking. The marinate acts as a tenderizer and to keep the meat juicier. Well you have made several points. Yes POW! Point deductions can be substantial, but if you build enough WOW! Points in advance, you can withstand even a large deduction. Get to work on some WOW! Points. You obviously need them. And actually your sister is quite reasonable when it comes to deductions. I got the grilling thing from both of you–but I do need to ask, what do you get on a gas grill you cannot get from my stove-top and oven method? There’s no wood taste and it’s effectively indirect cooking–same as an oven. Salting after requires more salt (read excess sodium) than doing it before., and in my opinion toughens the meat after it’s cooked. I couldn’t find one authoritative cookbook that advocated salting after. And I would not marinate an already Choice piece of steak in anything. It’s already tender and marinades hide the great taste of the meat. Marinades can be used for less expensive and thus less tender cuts of meat.